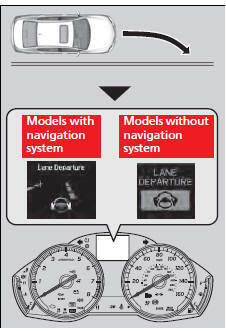 Alerts you when the system detects a possibility of your vehicle unintentionally crossing over detected lane markings. The system begins to search for lane markings when all the following conditions are met: • The vehicle is traveling between at 40-90 mph (64-145 km/h). 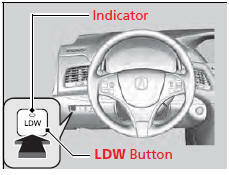 Never apply a film or attach any objects to the windshield that could obstruct the LDW camera’s field of vision. Scratches, nicks, and other damage to the windshield within the LDW camera’s field of vision can cause the system to operate abnormally. If this occurs, we recommend that you replace the windshield with a genuine Acura replacement windshield. Making even minor repairs within the camera’s field of vision or installing an aftermarket replacement windshield may also cause the system to operate abnormally. 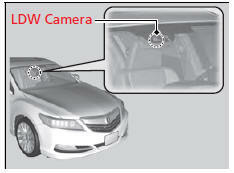 • Start driving the vehicle to lower the windshield temperature, which cools down the area around the LDW camera. LDW may not activate or may not recognize lanes, and may activate even when keeping in the middle of a lane, under the following conditions. ● When you drive on a wet road surface following another vehicle. - The camera may perceive the tire tracks in the water as lane lines. ● When there is snow or wheel tracks on the side of the road. ● When the road has many repaired area or an erased lane line. ● When the vehicle is running over painted signs or crosswalk markings. ● When you drive in a lane with worn-out lane markings.